I recently booked through Expedia where this was advertised as a 5 star hotel with free wifi and free breakfast. Although the room and the view were nice it is far away from everything and has no wifi, breakfast or even coffee maker in the room. The restaurant is not even a thing here anymore. The pool is lovely but is not only for hotel guests so there was often nowhere to enjoy a poolside lounge. Run don't walk to get away from this night mare. I booked this online through ""hotelbeds.com" . It claims to be a five star........one star is a stretch. Should be KD (knock down). It is in the middle of no where and without several stops asking directions, good luck finding it. There was no one there with the exception of an unfriendly young girl at front desk. I mean no one, no guests, no staff not even someone to help with luggage. There are dozens of steps to climb to get to hotel and especially the room. The room is terrible. Old, outdated and just plain dumpy and in need of repairs. No essentials of any kind not even a glass or tissue. Only two small worn out scratchy greyish white towels provided. No hand towels, no face cloths, bath mat , nothing! People talk about good food.......really. Where? No staff , no one in restaurant. We were there beginning of busy season and yet no other guests were evident but ourselves........pretty sad for sure. We left after one night and they would not refund us for the second night which we had pre paid for. I wouldn't stay there again if it was free. The only good thing was the view. This place is definitely not what advertised, not even close and it should be reported as misrepresented. Room tip: Avoid this hotel , it is the worst . We celebrated our 8 wedding anniversary in 1997. Everything was great the staff were fantastic. However we were told that the stair that lead to the beach will work on,,however after 15 yrs they still have not work on it...so that can be a big downfall. Nosotros celebramos nuestro 8 aniversario de bodas. todo estubo fantastico el servicio ni se diga. El hotel tiene unas gradas que te llevan a la play. Mas sin embargo en 1997 cuando visite, administracion digo que para el 1998 los escalones estarina terminados para poder bajar a la playa. Sin necesidad de tomar un taxi, que toma 20 kilometros para llegar a ella. 15 anos despues osea 2012 todavia ni nada de ver que trabajaran para reparar los escalones..:)..que TRISTESA!!!! Horrible experience in this "5 star" hotel that in real life is 2 stars. I booked this hotel online through "hotels.com" because it was way cheaper that calling in and checking the price. Be aware that the hotel is in the middle of nowhere, and very hard to get to. The images on the web are very deceiving, you will be disappointed when you get there. When we got to the hotel, the reservation had not gotten to them and they made me take out my computer and email a copy of my confirmation to the manager. This didn't bother me much, and i forgot about it. The room appeared to not be in use for a while, and indeed was the room that had that view of the beach. The price was not for this kind of hotel, it really falls short from expectations. The problem that made this experience horrible was the fact that when my mother showered, BROWN WATER FELL FROM THE SHOWER HEAD in the bathroom. It was disgusting, how could this happen at a hotel ! The water from the faucet also came out brown, imagine washing your teeth in that kind of water! Ewww! So i asked the kid at the front desk to come, he was new so he didnt know what to do and showed disgust at the water. He told us later after complaining that we had to speak with the manager, in his office! The guy didnt even bother to come to us and asks us what was wrong, we had to go talk to him! what kind of service is that?! The manager offered us another room, that wasnt in use for a long time and that had huge ants. How in the hell were we supposed to sleep with a baby in the room knowing that ants could crawl and bite her. BOTTOM LINE: It was not clean, it didn't offer a good service, the view is not even spectacular, and you are better off at another hotel in the city. We ended up cancelling the reservation and left to another hotel in the area. We stayed in Hotel plaza huatulco, we paid 1,000 pesos for 3 bed apartment each day, it was cheap as hell and very comfortable! Its just by the center of Tangolunda, Google it, it is the best option for traveling with a family. Avoid Casa del mar, it has ants, horrible service, and it looks like the owners are extremely cheap to pay people to clean the rooms everyday. Room tip: Rooms near the front have ants and insect coming in from the patio. 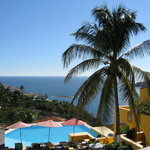 Casa del Mar has a wonderful location. The staff is very friendly and the food delicious. The breakfast is very good, especially included in the room price. We paid 100 $ per night and were very satisfied all in all, even if the rooms are not as comfortable as mentioned in the brochures. The only thing we would like the hotel to do is to repair the stairs that leads to the beach. Their proposal is to take a taxi (10 min. drive) to go to the beach. Who likes to do that when the target is to relax and you have an inviting beach down the stairs? Nevertheless, I would recommend this place. nota bene : we went during low season. Superb small, spacious, romantic hotel with a wonderful view and staff. A small group of us have been staying at the Casa del Mar every year in November after a humanitarian trip to Oaxaca MX. The hotel sits about 200 feet above the bay on a bluff. They have 23 rooms. Each room is spacious, clean, air conditioned and has a wonderful bedroom and large bathroom. Every room has a view of Tangolunda Bay from your patio. The room price includes a full breakfast and is reasonable. They have a beautiful pool which also over looks the bay. There is acess to the beach by using a walk way going down the hill. Claudia, the manager, has a great personality and bent over backwards to meet our every need. The resturant has very good food. My favorite is the the bacon wrapped stuffed jumbo shrimp. There is a small town close by called La Crucecita. The people are very friendly and gracious. I highly recommend this "hidden gem of a hotel".